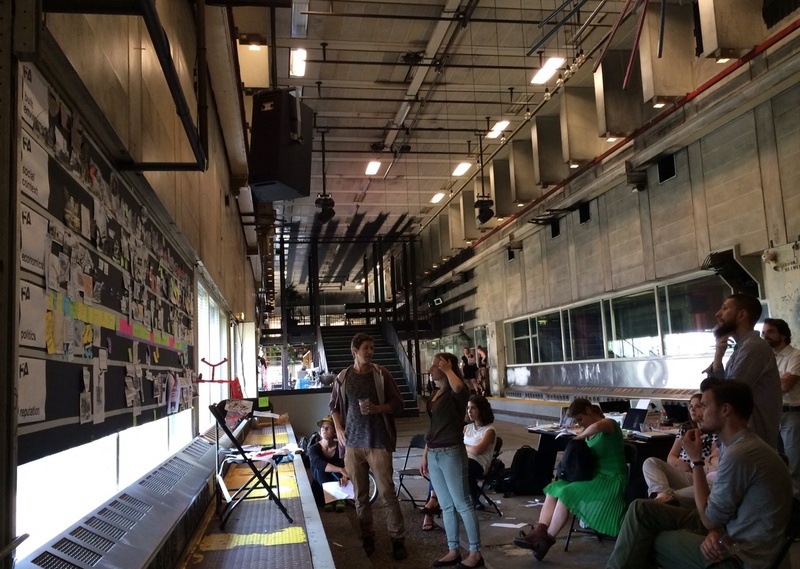 FA conducted a research workshop on the history and current developments of Trouw and Wibautstraat, for a long time Amsterdam's "ugliest street". As part of Summer School Thinking City, Failed Architecture, in collaboration with architect Lada Hršak, carried out a workshop, researching the rise and fall and recent renaissance of Amsterdam’s Wibautstraat. 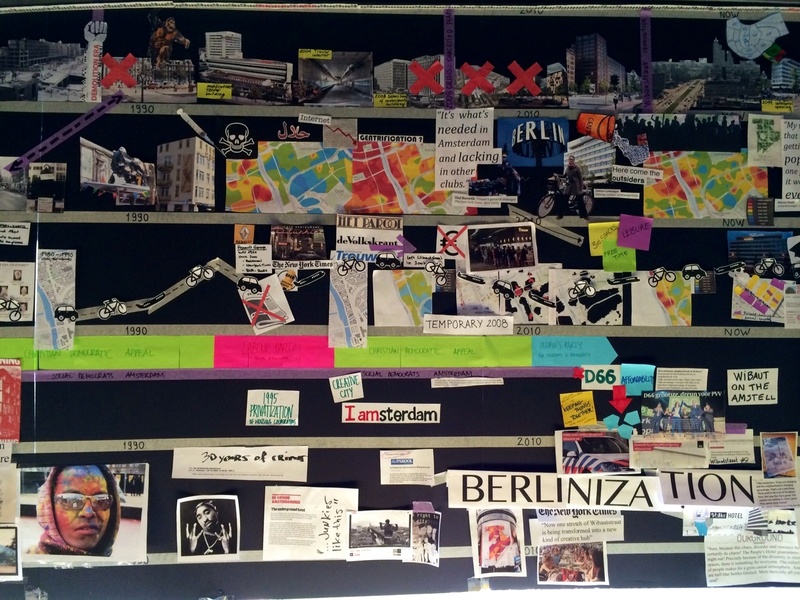 With a group of international students and young professionals, we created a timeline that tells the story of the people and events that shaped Amsterdam’s “ugliest street”, from the economic crisis in the 30’s and the Modernist dream in the 50’s to the street’s decline in the 80’s and 90’s. Discussing the Timeline of Failure in club Trouw, a former printing press. 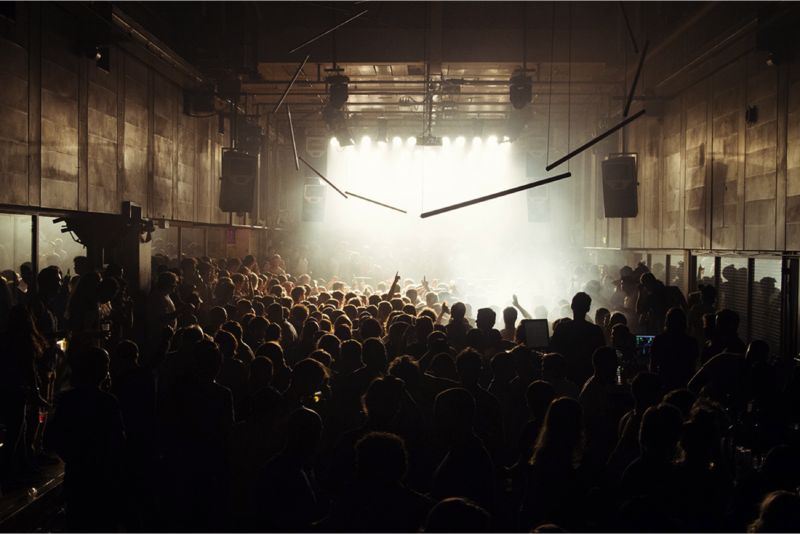 The last two decades saw a slow recovery, which accelerated after the arrival of club Trouw and an art incubator in the Volkskrant building several years ago. From no-go area, the street became a must-see hotspot for many. At the end of 2014 club Trouw will close its doors to make way for a Student Hotel, adding a new chapter to the street’s dynamic history. Originally, in the late 19th and early 20th century, the train from Amsterdam to Utrecht would cut through this part of town. The surrounding neigbourhoods, separated by the railroad, were dotted with beer breweries and cheap houses for the working classes. 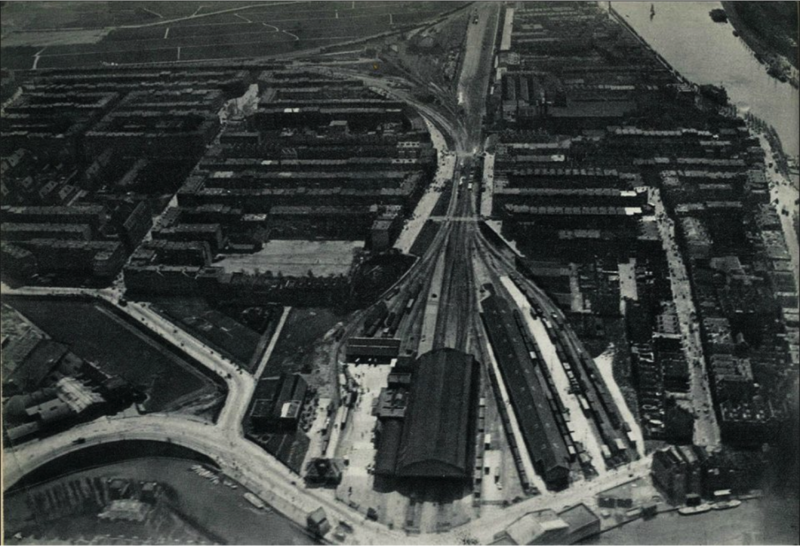 Image from 1910, with the Rhijnspoor station at the beginning of what later would be Wibautstraat, surrounded with beer breweries and working class neighbourhoods. In the 1930s, when the trains were redirected and after the demolition of the tracks and the train station next to what is now Weesperplein, the remaining open space was redesigned as an avenue. 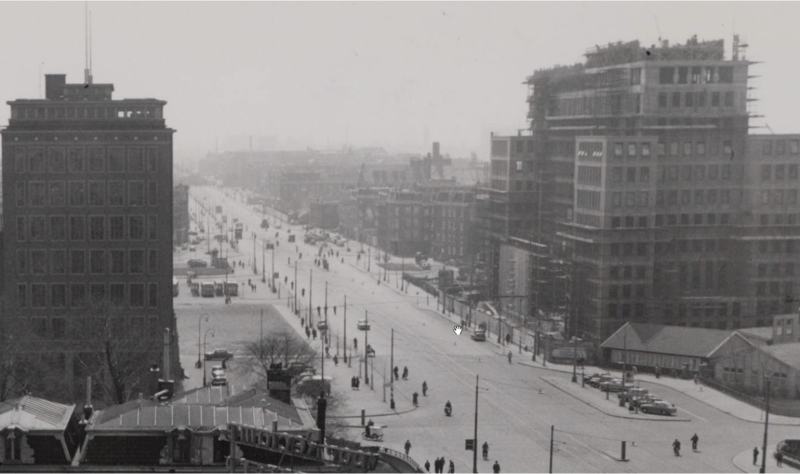 It was to rival the Champs Élysées in Paris or Berlin’s Stalin-Allee (now Karl-Marx-Allee) and Kurfürstendamm. However, the street never lived up to these high expectations. Image from the 1950s with the street just finished and the iconic buildings flanking the beginning of the street. Alongside the four-lane thoroughfare emerged a real hodgepodge of architecture, from truly majestic to plain miserable. 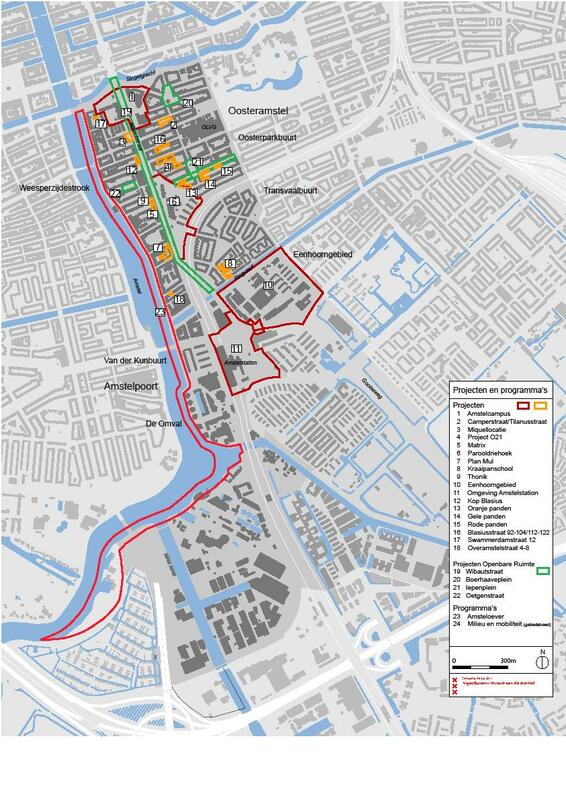 The street has created a heavily trafficked no man’s land, creating a barrier between the prosperous Amstel River waterfront (Weesperzijde) and other neighbourhoods, like Oosterpark- and Transvaalbuurt, that are facing a mix of problems and gentrification. For a long time nothing happened, no politician could ignite the long awaited regeneration of the street. Companies slowly abandoned it, with only commuters filling the space, zipping past by car or subway. But in the last five years, thanks to bottom-up initiatives by local entrepreneurs, the situation has turned around. Originally slated for demolition to make way for luxury condominiums, the Trouw building was saved. Now, five years later, the street has changed dramatically. Today during the weekends, TrouwAmsterdam, Baut and Volkshotel attract thousands of visitors. An upmarket pop-up restaurant, Baut, opened next door, new apartments are being built along the street and the former Volkskrant headquarters-turned-art-incubator has been converted into a creative hotel. Simultaneously, the neighbourhoods surrounding the street are in a process of gentrification. Wibautstraat (in green) and its surroundings. The newspaper triangle is at number 6. The concrete Trouw Building forms an architectural anomaly. Its industrial rawness stands out in a city known for its elegant residential brick-architecture. Together with the neighbouring Parool Tower it was designed by Dutch architects Van den Broek en Bakema in the late 60s to house the editorial offices of some of the country’s most important newspapers. The Trouw building and Parool tower in the 1960s. The two buildings sit at the heart of the so-called ‘Parool Triangle’, an area along the Wibautstraat, named after the prewar Alderman of Public Housing – and working man’s hero – Floor Wibaut (1959 – 1936). His statue now adorns the Weesperplein. Printing presses inside the Trouw building. 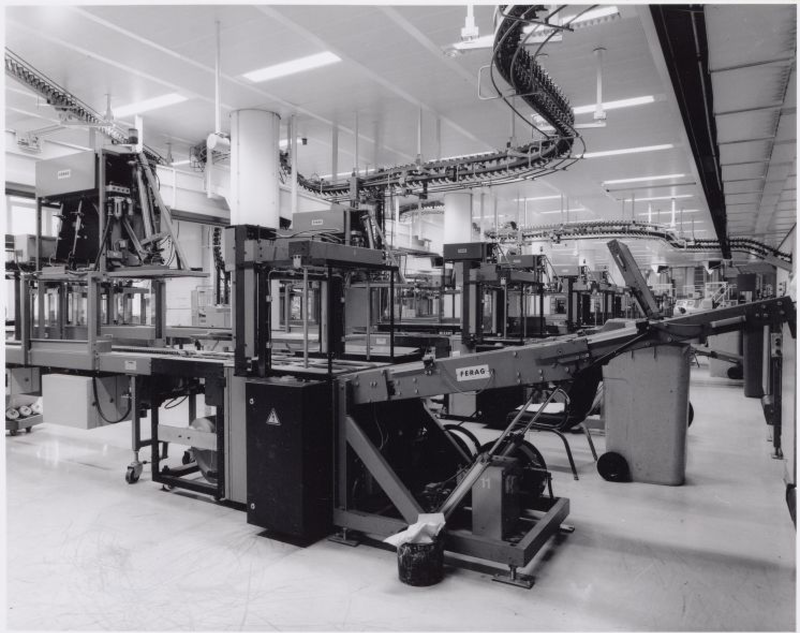 In a soundproof extension that was later added, printing presses were spitting out the daily news for several decades until the newspapers moved their operations elsewhere, leaving behind a cluster of buildings that were seemingly unsuitable for reuse. As it turns out, the building’s machine acoustics are perfect for music productions, the lack of daylight creates the surroundings for an intimate experience, and the vast concrete surfaces serve as perfect projection screens and canvases for the display of art. While the Wibautstraat underwent a metamorphosis, the Trouw-building has remained largely untouched. 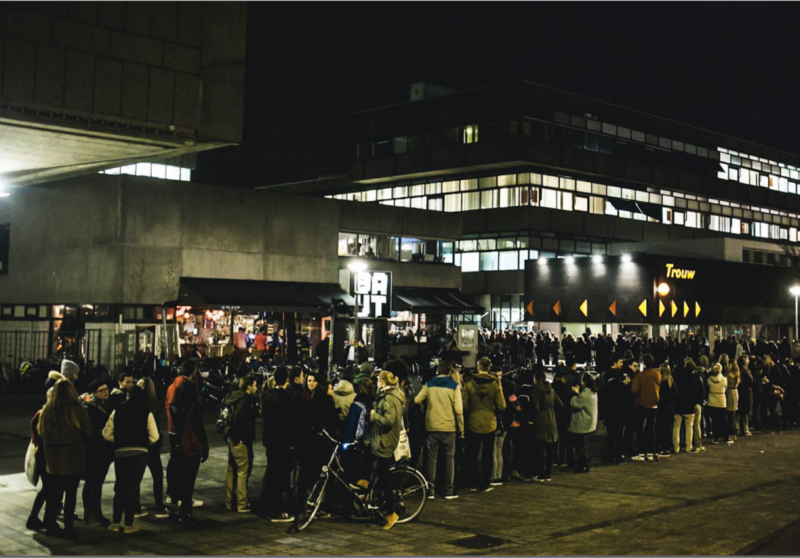 With club Trouw closing its doors at the end of the year, we wonder what will happen next to the street and its surroundings? And how will historians look back on the present time? In the first week of the summer school, the participants constructed the timeline, which was the basis for their work in the second week. 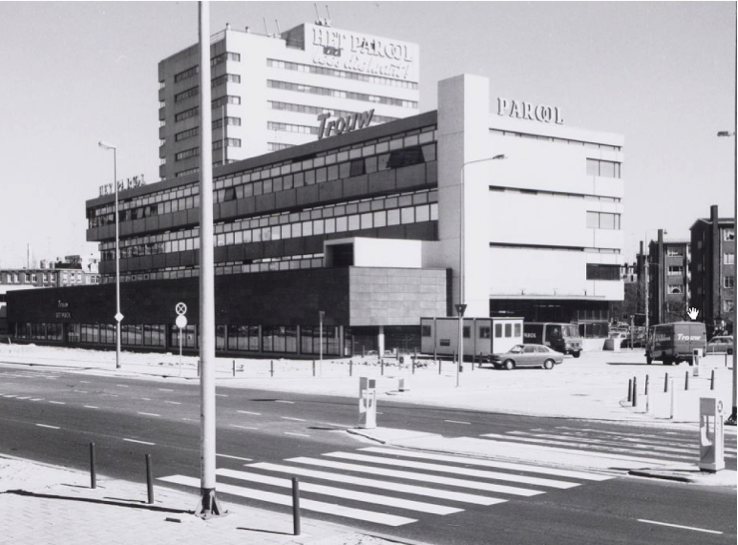 They decided to make a video, telling the story of the Trouw building, Wibautstraat and its surrounding neighbourhoods. Take a look at the great result below, with former deputy director of Amsterdam’s spatial planning department, Zef Hemel, as Floor Wibaut (after whom the street was named).